This isn't so much of a tutorial, but I more of a talk through about how I'd go about I getting my hair in a messy bun. I think most of the time I find it is down to trial and error, especially when it comes to the perfect messy, but also somewhat done bun. I have to admit that when I do this technique sometimes my hair looks perfect on my first attempt but sometimes it doesn't. So don't worry if your get it wrong the first time just go back and try again! I made a gif to illustrate my points a little better, so hopefully it makes it a little easier to follow! But Zoe does have a very good tutorial in video form if that floats yo' boat! 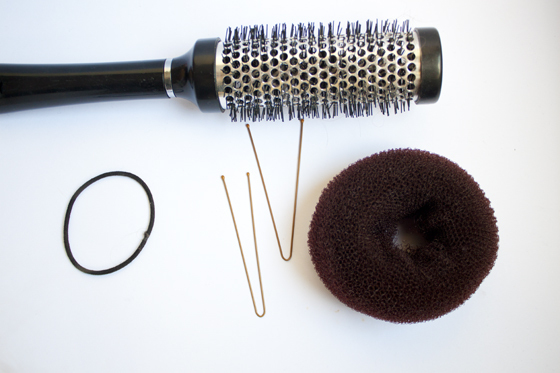 I tend to always use a hair doughnut as I feel it gives a much better shape to the bun. You can pick these up from loads of places like Primark, Boots or Claires Accessories for really cheap, I know the Primark ones are just £1! I then pull my hair up into a high ponytail and secure with a hair band. I then thread my ponytail through the hair doughnut and then wrap the rest of my hair around it so it's compeltey covered. I then take hair pins, the ones thats are basically like this as I find them alot better at keeping the hair in place than regular bobby pins, but they work just as well. You can also secure with a hair band, but I think pins add to the messy effect a bit more. I then sort of pull bits of hair outwards without actually moving the bun, It's hard to explain but I just sort of pull the hair away from the scalp so it sits a bit loser away from the head. I then pull down a few tendrils and then mess around with the overall appearance and shape of the bun until I'm happy with it then I'd give it a quick hairspray! And its done! Anyway I hope that was enlightening and a little helpful, If not, for the lolz you got to see my hair in a ponytail which literally, don't even say it looks good and I should wear it like that because its hideous and they just don't suit me at all! Even as a child I used to loathe wearing it like that! 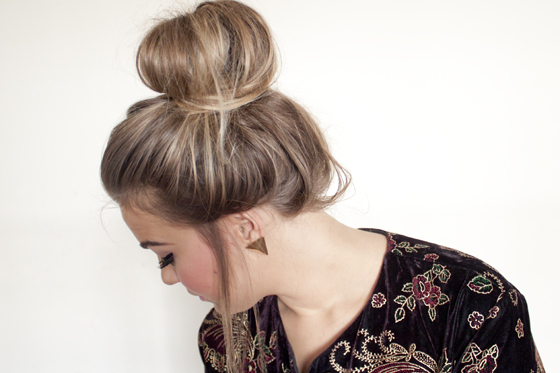 This is the perfect messy bun!